Commercial pressure washing is beneficial for many different reasons. Your business should always put its best foot forward, and having your business pressure washed is one way to make sure your business always looks its best. Here are other reasons your business should invest in commercial pressure cleaning services. Your business has one chance to make a great first impression. you can’t make the perfect first impression when your building and sidewalks are dirty, and your windows have greasy fingerprints on them. To make a good first impression, everything has to be in place. Not only do your services and staff have to be at their best, but the outside of your building must be flawless, and Window Cleaning Miami can help with that. It’s a good feeling to save money, and you can do so by hiring professional commercial pressure washers. Without professional pressure washing expertise, you will face a variety of problems that can be expensive to fix. Some of these problems include developing cracks in the walls and sidewalks, having to replace windows quicker than usual, damaged gutters, and possible lawsuits due to people slipping and falling on your property. You can save money and avoid all of these mishaps by hiring experts who get the job done correctly the first time. Pressure washing removes debris, harmful bacteria, and toxins from surfaces. Mold, algae, and other fungi can safely be removed from the outside of your business building. Mold and mildew can cause respiratory issues and other health concerns. Algae leave hideous dark green and black marks on the roof your business building and could cause you to lose customers. The health and safety of your customers and business are important, and when you take both of these instances into consideration, your business will thrive. Owning and running a business is expensive and time-consuming. A great way to beautify your business is to schedule regular pressure washing sessions. Scheduling these sessions prevent your building from experiencing extensive damage due to uncleanliness caused by excessive dirt and dust. We can protect your investment by preserving the exterior of your building by thoroughly cleaning it on a regular basis. What’s the Difference Between Power and Pressure Washing? Power washing and pressure washing are both methods you can use to clean a building. 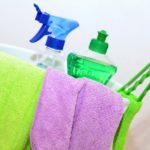 These cleaning methods can also be used to clean a home. Pressure washing is a cleaning method that is used to clean surfaces that have stubborn, ground-in stains, such as a driveway, sidewalk or roof. Pressure washing is great for these situations because the pressure of the cleaning solution can remove the stains. Power washing uses hot water to remove set-in stains and can often be used on fragile surfaces because a low pressure threshold of our cleaning solution is used. At Window Cleaning Miami, we are licensed professionals who are ready to help you improve your business by offering our services, which include window cleaning and pressure cleaning. No job is too big or too small for our commercial pressure washing services. Contact us today for your free, no-obligation quote.